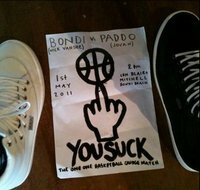 A new thing has just exploded onto the basketball courts in Bondi. Organised by mister Daimon Downey this event was pretty epic. Speakers built into painted garbage bins pumping tunes for the day and all the crews came to watch. Good turn out. Time for Round 2!